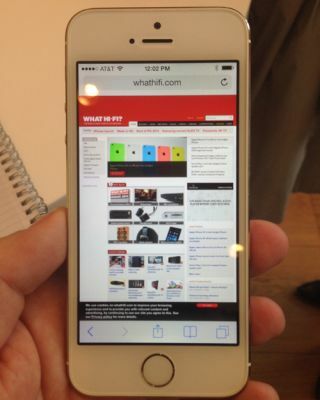 Hands on: Apple iPhone 5S review | What Hi-Fi? At first glance, the iPhone 5S, Apple’s new top of the line handset, is identical to the current iPhone 5, apart from a silver ring around the home button, and a rather lovely new champagne finish (which is, thankfully, a lot less bling in the flesh – and actually incredibly subtle). The iPhone 5S handset maintains the same feel in the hand as the iPhone 5, which is no bad thing, and sets it apart from the new iPhone 5C. The first thing you’ll notice is the home button, and its new fingerprint sensor. Training takes a few minutes, as you’ll need to repeatedly tap the sensor from different angles as a ‘map’ of your fingerprint builds up on screen. Once that’s done, simply putting your finger on the sensor unlocks the phone instantly, and worked flawlessly in our quick test. Each phone can have up to 5 users, although they all see the same handset once it's unlocked – so no separate menus for the kids. In use, the Apple iPhone 5S is incredibly snappy, and initially feels much quicker than the iPhone 5, thanks to its souped-up processor, the brand new A7 chip. This is also most people’s first glance at iOS 7, and the new look Apple operating system really flies. The new video and music playback apps have had a complete overhaul, with the music app looking a lot more minimalist, and easier to navigate around. The new notifications menu also makes a big difference, allowing you to change song easily without unlocking. The new camera system looks impressive, although we were unable to compare in absolute picture quality terms to rivals such as the excellent Sony Xperia Z. Images appeared, in our limited tests, to be exceptionally sharp, noticeably more so than the iPhone 5, while the burst mode, which can take 10 snaps a second was also impressive. Overall, while it’s definitely an evolution of the iPhone 5, the 5S seems to do more than enough to warrant an upgrade. The fingerprint sensor alone, which worked perfectly for us, even in Apple’s busy demo area, is a huge timesaver. It's also an added layer of security desperately needed on modern devices, with Apple itself admitting that 50% of iPhone 5 owners don’t even have a passcode. When combined with the speed boost and dramatically improved camera, the iPhone 5S is set to be formidable new opposition for the best Android phones, such as the HTC One and Samsung Galaxy S4, in terms of features, design and build quality. More details and hands on pictures to follow.